This is a classic video slot game from WMS, with incredible arcade-style graphics, 3-D surround sound. More than that, Top Gun slots has a built-in seat that actually shakes and moves when you play! One of the things people notice most about this game is the bonus feature, which sees you as the pilot in a movie style arcade game, collecting bonus points as you fly over and shoot your targets along the way. Imagine sitting in the cockpit of an F-14 Fighter Jet gunning down enemy aircraft just like the pilots did in the classic movie “Top Gun”. Feel the rumble in the Bose® Space™ Surround Sound Gaming chair as jets whiz by in true 24-bit color aided by the next generation graphics on the CPU-NXT2™ platform. 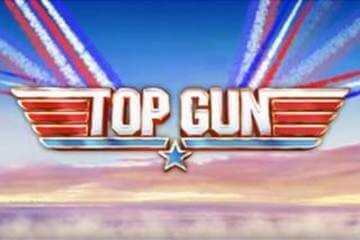 Experience a new form of gaming, sensory immersion gaming, that pulls you into the action and never lets you go until you’ve had your chance at piling up bonus credits and reaching the ultimate ranking of “Top Gun”! The first thing that strikes you about this slot is that the way it’s set up to look and feel like a video game. This similarity to a video game becomes even greater when you play and you trigger one of the bonus features - seeing you flying through the sky in true video game fashion, collecting bonuses as you fly. In bringing out Top Gun, WMS have coined a new phrase - ‘Sensory Immersion Gaming’ - As the phrase suggests, the technology and game-play bring you right into the slot play in a totally new way. Pleasingly, the slot itself is a good one with plenty of features. Many of the Top Gun slots are embedded into the WMS progressive Jackpot system and so you can win very big money by playing it. One thing for sure, this game is a millin miles from the classic 3 reel slots you see in casinos - the style and graphics says a lot about the way games in Las Vegas will be heading in the future.